Optional excursion to Abu Simbel from £85 per person. Visit the High Dam of Aswan, the granite quarries from whence the stone came to build most of the temples and the Unfinished Obelisk. Continue to the island of Philae with its stunning Temple of Isis, dedicated to the mother of all the gods, which would have been submerged when the dam was built, had it not been relocated. 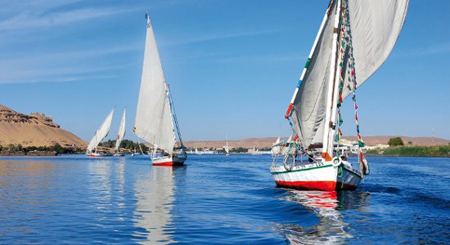 Sail on the Nile in a traditional felucca around Elephantine and Kitchener’s Island. Sail to Edfu to visit the Temple of Horus, the falcon God, whose battle with his evil uncle, Seth, is told in vivid pictures inscribed on its walls. Breakfast on board and then visit to the West Bank including the fascinating tombs of the Valley of the Kings and Valley of the Queens. You will visit 2 or 3 tombs in each, to view the intricate wall paintings and learn more of the ancient Egyptians’ beliefs concerning the afterlife. The tombs are open according to a system of rotation, to minimise damage caused by visitors, and there is an additional charge for visits to the Tomb of Tutankhamun and Ramses VI. Continue to the aweinspiring Temple of Hatshepsut, the resting place of the only female Pharaoh and the Colossi of Memnon, two gigantic statues, which are all that remain of the temple of Amenophis III, once even bigger than Karnak. After lunch visit the Temples of Luxor and Karnak, dedicated to the Theban deities, and linked by an enigmatic Avenue of Sphinxes. Karnak is the largest of the Nile temples and its most impressive, comprising three separate temple enclosures and a Sacred Lake. The Temple of Luxor is very wellpreserved and all the more dramatic for its location facing the Nile in the centre of the modern city.